Whether enjoyed on the go, alongside a newspaper, after a meal, or as a companion, coffee is of different uses to many. My dad, a 1993 immigrant to New York City, described his experience with drinking coffee back then as a wholesome, introspective moment. Every morning, my dad said he would run into the nearest bodega to his apartment, greet each employee, grab a coffee, and drink it as he hustled to work or the library. In the afternoon, he would sit at his desk with a second coffee, read the paper, and catch up on the daily news. A moment to self-reflect and on current events. When I asked my dad what coffee symbolized to him at that time, he emphatically told me when he felt alone as an immigrant, coffee was an essential companion for him as he unwound after a long day. Coffee comforted him and made him feel safe. For my British roommate, coffee symbolizes a time to sit with the newspaper and catch up on current events. For me, coffee is a versatile drink I find myself enjoying as I galavant around the city. For every mood imaginable, there exists a corresponding cafe, restaurant, or bar for to satisfy your daily caffeine intake. Inspired by its historical roots in New Zealand, Happy Bones is our go-to when we’re craving equal parts culture and coffee. Here, you can sip your espresso over a display of global publications and amazing local art. It’s minimalist, it’s chic, and it’s conveniently located between Little Italy and SoHo. The coffee is delicious—and they have free Wi-Fi! Did we mention they make merch? You will be hard-pressed to find another coffee shop like Spreadhouse. Something about this open-concept space reminds us of our mellow aunt’s living room, from its cozy couches to its meditation-ready floor cushions. Oh, let’s not forget about the hanging basket chair in the back… You could call it an instagram thirst-trap. Spreadhouse’s eclectic aesthetic also translates to its extensive menu, which includes coffee, beer, wine, and light bites. Coffee in the front and a hair trim in the back? At Ludlow Coffee Supply you can enjoy a tasty selection of pastries, toasts and, of course, coffee all the while the back half of the small shop is bustling with the excitement of Ludlow Barber Supply. 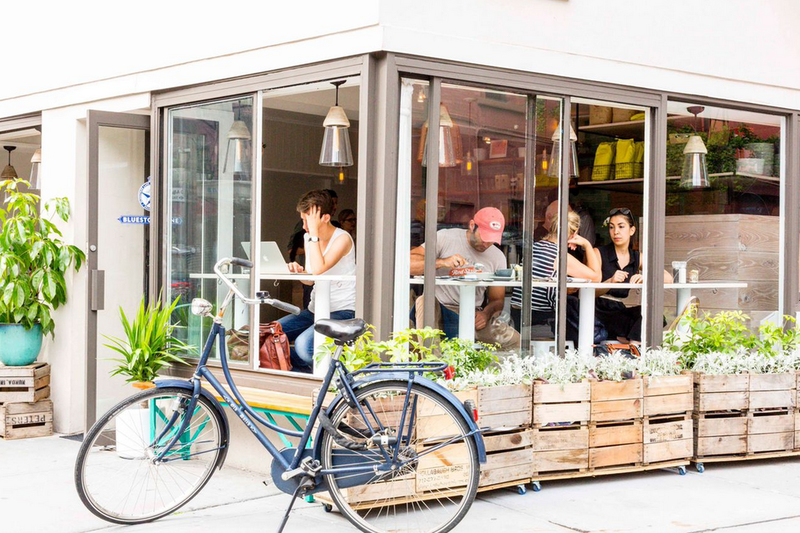 This LES coffee outpost serves up its own proprietary blend of beans which are best enjoyed on a Sunday afternoon walk around the neighborhood. Lucien is an upscale French-Moroccan fixture of the East Village with a typically artistic and cool crowd. Its most well-known tradition is the steak frites, always served with a delectable pepper sauce, is best paired with the espresso martini for a little kick in the evening. My friends and I love going to this place for dinner, we always meet very interesting people. An Aus-inspired “cafe” but not quite as casual, leans a bit more towards a restaurant. Typically, I find myself here midday Friday, rewarding myself after my 8AM class. While popular for brunch, Bluestone Lane’s other location on Astor Place are a perfect pit stop en route to campus. Recommendations: Ginger Latte or Iced Matcha Latte with Almond Milk; Avocado Smash with Poached Egg and Smoked Salmon. Ah, La Colombe. Often times a point of contention whether or not to like or dislike this coffee purveyor’s vibe, but at Embodied we’ve landed on the definitive side of love. Despite its origins in Philadelphia, there is something quintessentially New York about the location closest to campus; it could be the long line you’re bound to encounter, or the crowd of those eager to stay in the shop, or, most likely, it’s their perfect and consistent brew that keeps you coming back. If the sun is shining and there is a seat open on the bench overlooking Lafayette, see or be seen and sit and enjoy! Roasted in Bushwick and served up in Manhattan is City of Saints Coffee. Their Astor Place cafe is the only Manhattan location of City of Saints and the bar setting overlooking 10th street and 4th avenue is a great place to watch city life drone on while you take a sip.